You planned to do a backup. Now your PC or Laptop is broken and you don't have a current backup of your data? Then, good advice is now expensive. Rely on us with a complete, professional Data Recovery in Berlin and prefer us to affordable conditions. We reinstall your operating system professionally. The Reinstallation contains lots of useful free software - installed and configured. So we can afford you a fresh, fast system, ready to work on your device immediately. Which operating system is suitable for my laptop? We offer you a wide range of installable operating systems. Which is the most suitable for your device, depends on the technical specifications. 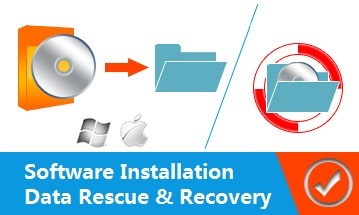 The Reinstallation contains a full package of all necessary software and configurations - set up ready to use. All Settings, Drivers, programs like Anti-Virus, Ad-Blocker, Write Program, various Browsers, and much more are set up from scratch. You can benefit from our free diagnosis! Before performing a data recovery, we check your computer or laptop and notify you, if any specific action is feasible. Notice: The less attempts and runtime a faulty device has after getting damaged, the higher the possibility of a successful Data Recovery. Let us specialists in Berlin do the successful recovery of your data, please don't try it on your own. Even in difficult cases we are the spot to rescue your lost or deleted data for affordable prices. Your benefit: You only pay on success! Your operating is corrupt and you don't have any access to your data? In this case we focus the diagnosis to the harddrive. We check the harddrive and other components by using a series of checks with our test systems to ensure that the harddrive is physically and structurally(Volume check) fine. At first, we repair your operating system, so that you can keep working in your familiar interface. If a repair is not possible, we backup all your important data on an external drive, reinstall the operating system and set it up properly. Can I keep my data in the new system? We offer the migration of your data and settings to your desired system. The advantage is obvious You can continue to work as usual. The level of migration depends on the software, whose setting has to be migrated. What does the Migration contain? Which data and settings will be migrated? The Migration contains the Import of your data to its original path and the customization of settings and program data. Information: Because of the variable structure, (standalone) programs can't be migrated! If you want to have new software installed on your PC, Apple MacBook or notebook, or even intend a change or upgrade of your operating system: We are happy to help.